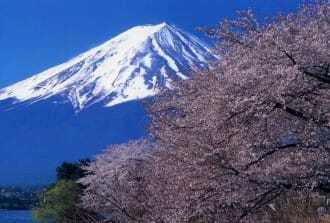 The cherry blossom is an iconic flower in Japan. 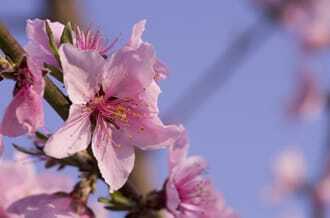 Cherry blossoms, or sakura, start blooming in late March and are something you’ll want to see in the spring. 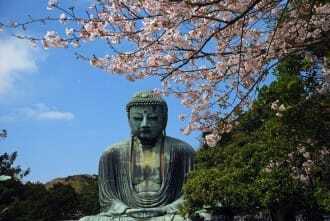 Find out how to enjoy hanami and view the blooms in Osaka. The cherry blossom season arrives as the weather becomes warmer and winter ends. 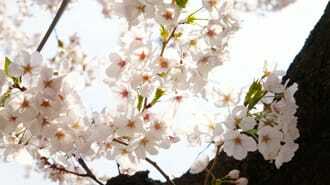 In Japan, crowds of people make their way to visit hanami (flower-viewing) spots annually to see these cherry blossoms. 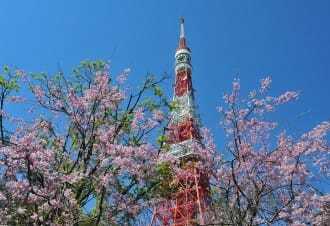 There are also several hanami spots in the popular sightseeing Osaka area. In this article, we’ve compiled a list of our ten recommended places. Please take a read and find your favorite spot. 10. 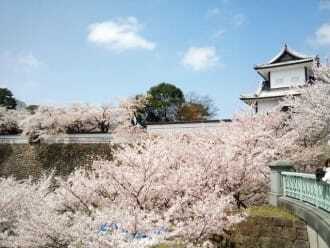 Katsuo-ji Temple: Missed the Blossoms in the City? No Worries! 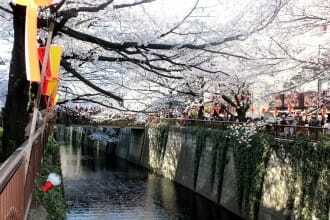 Okawa River flows through central Osaka and is a must-visit spot for hanami during cherry blossom season. 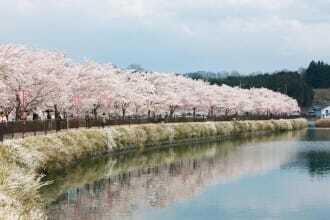 Approximately 4,800 cherry blossom trees bloom along the river. You can immerse yourself in spring with the light pink color that transforms this area during the flowering season. On the Okawa River Sakura Cruise. you can view these cherry blossoms from the water. 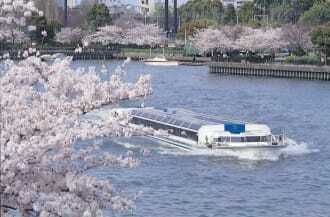 The cruise 25 minutes long and allows you to enjoy the rows of cherry blossoms on the riverside. Kema Sakuranomiya Park and the Japan Mint, both famous cherry blossom spots, are on either side the river. You can admire these cherry blossoms on a stroll, but seeing the blossoms from a boat is a special experience that we recommend trying. The boat does not get very crowded, so we recommend this cruise to visitors who want to view the flowers at a relaxed pace. Osaka Castle Park is home to Osaka Castle and Nishinomaru Garden. 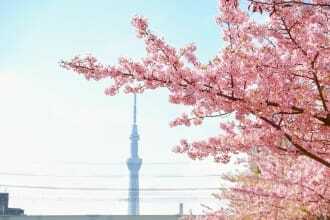 The cherry blossom tree used to determine and announce when the blooming period starts in Osaka is located here. Nishinomaru Garden, where you can see about 300 blossoming trees, including the classic Yoshino cherry variety, is a must-see. 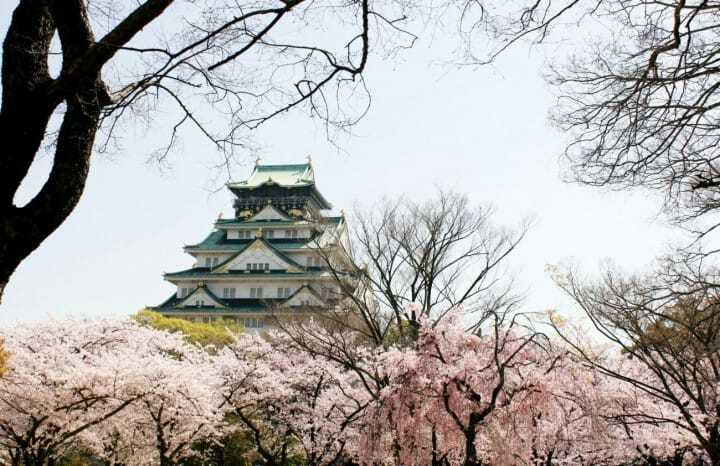 The gardens offer a stunning view of the sakura and Osaka Castle. Once night falls, the illuminated Osaka Castle and cherry blossoms create a dazzling view different than during the day. The park does become crowded during the cherry blossom season, so we suggest arriving early in the day to find a spot. 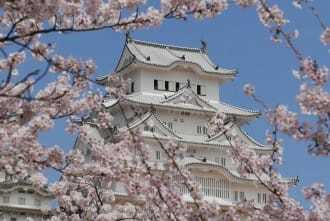 Everything You Need To Know About Osaka Castle, The Symbol Of Osaka! The Expo ’70 Commemorative Park is the site of the Japan World Exposition held in 1970. The tall Tower of the Sun is a very impressive and iconic statue that was created by artist Taro Okamoto. Approximately 5,500 cherry blossom trees of nine different species, including the Yoshino cherry and shidare-zakura (weeping cherry) varieties, dye the park entirely in pink. 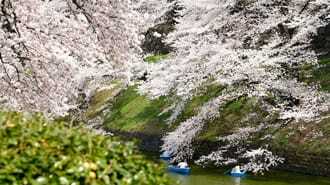 The park is designated as one of Japan’s Top 100 Cherry Blossom Spots and is worth seeing. We recommend this park for a picnic as it is very large. Bring a classic bento box or lunch with you and visit the park together with your family. Picture courtesy of Japan Mint Inc. The Japan Mint is in Kita, Osaka. It is not normally open to the public, but the property is partially opened annually for a just one week when the Yaezakura (*1) flowers bloom. The event held during this one week is called the Cherry Blossom Passage. 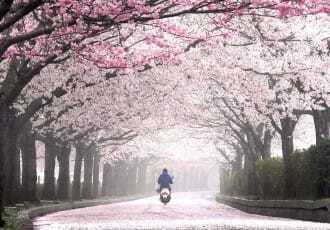 The Cherry Blossom Passage is known for having an abundant variety in cherry blossoms. 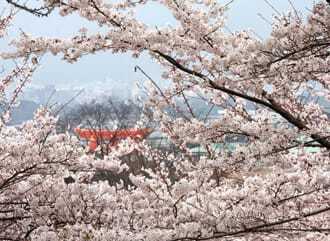 134 types of cherry blossoms bloomed in 2018. This is the only location where you can see rare blossom varieties in Japan! Please note there are several rules to follow here, including adhering to one-way traffic and only observing the trees. Consult with the staff when visiting to be polite. *1 Yaezakura: a cherry blossom variety. They bloom later than other cherry blossom varieties. It is also called the botan (peony) cherry blossom. Daisen Park is next to the Mausoleum of Emperor Nintoku (*2), an emperor who ascended to the throne around the fourth or fifth century. The park contains a pond and an open grass lawn. You can also experience Japanese culture here at the Japanese garden and teahouse. The park is registered as one of Japan’s Top 100 Historical Parks. Once cherry blossom season arrives, the entire park turns a soft pink color from the 400 cherry blossom trees surrounding Dora Pond. This spacious park is filled with enough entertainment for a full day of fun and is ideal for both children and adults. Daisen Park bustles with families that come enjoy the flowers every year. If you’re on a family vacation we suggest bringing a lunch box to enjoy. *2 Kofun: a type of gravesite made in ancient Japan. It a tomb typically for influential persons or those with high social status. There are various types of sizes and shapes. Mt. Hiryu Meioji Temple is in Ibaraki City in northern Osaka Prefecture. The 73-meter tall tower and spherical sculpture here draw the attention of travelers. The temple is also called “Ibaraki’s Benten" by the locals. Benten refers to Benzaiten, one of the Seven Lucky Gods in Japan. Visitors to this temple are thought to receive blessings related to water, wealth, and relationships. 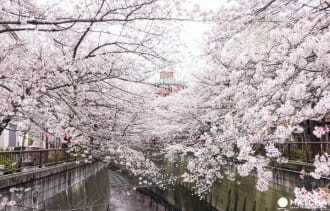 Approximately 500 cherry blossoms, including the Yoshino cherry, bloom in the keidai (*3). 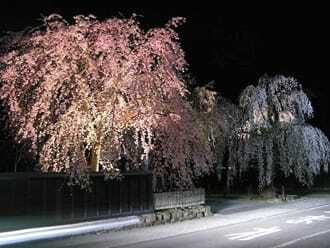 The cherry blossoms in full bloom become illuminated once it gets dark, creating a very elegant and refined atmosphere. The captivating evening cherry blossoms reveal a different beauty than the daytime view. This location is ideal for both daytime and nighttime flower viewing. *3 Keidai: the inside of the grounds which a shrine or temple is built on. Satsukiyama Ryokuchi brims with nature and is in Ikeda City in northern Osaka Prefecture. On the grounds, you’ll find hiking trails, Satsukiyama Zoo, and Satsukiyama Park. The area is crowded during the weekends and holidays as it is a popular excursion spot for families. Around 35,000 cherry trees bloom on this vast area, so we recommend enjoying the blossoms while taking a stroll. There are a total of nine hiking trails including the Omoji Course, suitable for beginners, and the slightly sloped Satsukidai Course. A trail map can be found on the Ikeda City Tourism Association’s official website (Japanese). Once you’ve had your fill of flowers, you can visit the Satsukiyama Zoo (Japanese). Admission is free and it will be fun to see the wombats and other adorable animals. 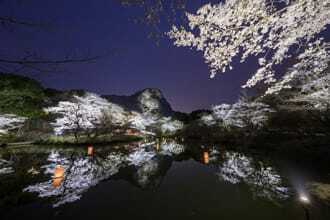 Once it becomes evening, the cherry blossoms are illuminated by the light of chochin (paper lanterns). The sight of the cherry blossoms faintly illuminated by the lanterns is very magical. Yamanakadani Valley is in Hannan City, on the border of Osaka and Wakayama prefectures. It was once an area that prospered due to the sankin-kotai, or alternating residence law, during the Edo period. However, the Yamanakadani District has become less populated over time. 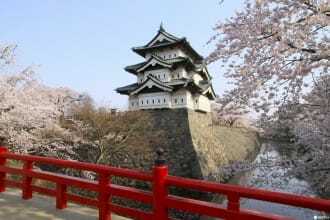 In efforts to revitalize the region, cherry blossom trees began being planted on the riverside of Yamanaka River about 50 years ago. Now around 1,000 cherry blossom trees bloom here. The cherry blossoms on both sides of the railway tracks near Yamanakadani Station on the JR Hanwa Line create a cherry blossom tunnel. If you are interested in trains, make sure to see this spot. 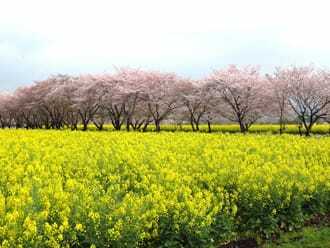 Yamanakadani Valley is also famous for its cherry blossom festival! This festival is held annually at Wampaku Kingdom just outside Yamanakadani Station on the JR Hanwa Line. The celebrations include lively performances. Kishiwada Castle is located in Kishiwada, a city famous for the Kishiwada Danjiri Matsuri (*5). This castle is smaller than Osaka Castle, but it has unique stone walls constructed with three different stacking patterns and a wide water moat. It is a must-visit spot in Kishiwada. Approximately 170 cherry blossom trees are on the grounds. The fallen cherry blossom petals floating on the surface of the moat looks stunning. At the Senshu Product Exhibition, held at the same time as the cherry blossom festival, visitors can purchase local specialties. This is a lesser-known spot we recommend if you want to avoid large crowds but want to see the cherry blossoms. You can view the flowers in comfort here. *5 Kishiwada Danjiri Matsuri: a festival featuring danjiri (festival carts or taiko drum floats). It is held every September and has an average attendance of 500,000 people. Katsuo-ji Temple is located in Minoh City in northern Osaka. Known as a temple that will grant you luck for competitions, you’ll find several kachi-daruma (winning daruma) on the grounds. It is said that shogun, or military generals, would visit the temple to pray for victory in their battles. This temple has a history of around 1,300 years. The flowers in Katsuo-ji Temple bloom late due to the high altitude. If you were busy and couldn't view the cherry blossoms at other locations you can see them before the season ends by visiting. 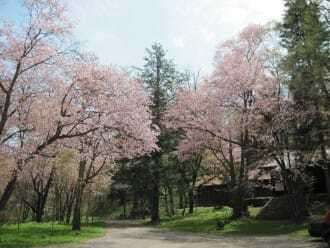 Various types of cherry blossoms, including shidare-zakura, will greet you when you arrive. 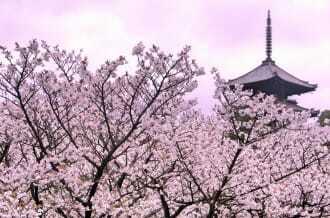 Around 8,000 cherry blossom trees cover the temple grounds. 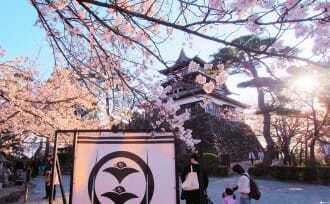 The vermilion main gate and the pink cherry blossoms energize the area with their beauty. Make sure to take a picture for your Instagram account. There is no public transportation available at night, so it would be more reassuring to travel by car or taxi. Did you find a location you want to go to? 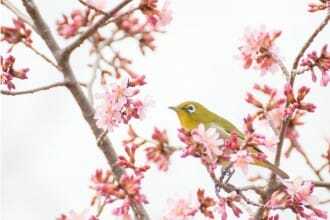 Please note that the blooming period for cherry blossoms is just one week. In order to enjoy the season, make sure to plan where you want to go and learn around when the season will start!